A group of Red Pikmin drowning. Water is the most common hazard and obstacle in the Pikmin series, since it is presented mostly through bodies of water that are a part of the terrain itself. Water is a hazard to most Pikmin types, given that they cannot swim nor breathe underwater. The exceptions are Blue Pikmin and Bulbmin, making these two types of Pikmin ideal to handle underwater tasks. Winged Pikmin can also fly above the surface, making it possible to transverse bodies of water with them in the group. Water in and of itself is not harmful to the Pikmin. Some bodies may be too shallow for the Pikmin to drown in, in which case they are completely harmless. Geysers also spew out water with immense force, but the Pikmin simply ride them in order to leave the cave. Rain in Pikmin 3 also has no adverse effect on the Pikmin. In Pikmin and Pikmin 2, leaders, Blue Pikmin, and Bulbmin stick to the bottom of the terrain while underwater, and gravity acts as if they were on land. In Pikmin 3, Blue Pikmin were given the ability to swim, allowing them freedom to move up and down, such as when chasing aquatic enemies. Leaders will always remain on the ground, however, and when they throw a Blue Pikmin, said Pikmin will slowly ascend and descend while underwater. In Hey! Pikmin, water can also be lethal to non-aquatic enemies. In order to cross bodies of water safely, Olimar must either not have any non-Blue Pikmin with him, or he must throw the ones that can't swim at Seeding Dandelions. Olimar and the Blue Pikmin can swim in water in this game, and the Pikmin will follow Olimar around and come back when thrown underwater. Any inapt Pikmin type that touches water will begin flailing at the surface. They will eventually stop and drown, resulting in a Pikmin death. Pikmin in this state might be saved by having them slowly flail towards the leaders, and luring them to dry land. Pikmin in Pikmin 3 will follow leaders automatically, but in the previous games, they must first be whistled. Alternatively, if there are idle Blue Pikmin nearby, they can toss drowning Pikmin onto land in Pikmin and Pikmin 2. Bodies of water are not the only way Pikmin can suffer from a water hazard. 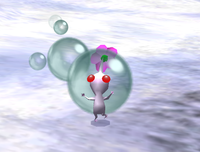 Some enemies have attacks that wet vulnerable Pikmin in such a way that a bubble of water forms around the top of their stem. This is enough to leave them choking and running in panic. If they're whistled in time, they will instantly return to normal, but if not, they will eventually collapse and die. These water attacks will cause damage to leaders as well, and can knock them down. Some bodies of water may cover the way to an important part of the area, where non-Blue Pikmin are needed. These pools might have a clog, which can be destroyed in order to drain the water, a bridge that can be built and used to cross over, or some lily pads can be taken to ride through and across a stream. Alternately, Winged Pikmin may be used, as they can fly above the surface of the water. A White Pikmin choking because of a water bubble caused by the Watery Blowhog. Most commonly, water can be found as natural bodies of water, like lakes or puddles. Some other sources of water exist, and can affect Pikmin that are not Blue Pikmin or Bulbmin. Watery Blowhog – an enemy that can blow streams of water. Caustic Dweevil – an enemy that sprays some watery liquid if provoked. Skeeterskate – an aquatic enemy capable of spitting water from afar. Goolix – a minor boss in Pikmin, with a water-like gelatinous body. Titan Dweevil – the final boss in Pikmin 2 has a weapon that sprays huge globs of water around the arena. Plasm Wraith – the final boss in Pikmin 3 can spit out Elemental Plasms that morph into huge bubbles of water. Blue Pikmin and Bulbmin are the only type of Pikmin that can breathe underwater. They can walk on the floor of bodies of water without a problem, and in Pikmin 3, can also swim through them. Bubbles of water that would choke other Pikmin also do nothing to Blue Pikmin and Bulbmin. In Pikmin and Pikmin 2, Blue Pikmin that are pointed to drowning Pikmin will go to them, grab them, and throw them to shore, although Bulbmin will not. Fiery Bulblaxes and Pyroclasmic Slooches will lose their fire if they enter water. The Fiery Bulblax will reignite if it leaves the water, but Pyroclasmic Slooches need to touch another Slooch's fire trail. Members of the mandiblard family in Pikmin and Pikmin 2 will lose health at a steady pace, as long as they are underwater. Wogpoles and Puckering Blinnows will swim freely in water, but will begin flailing around if they find themselves on dry land. If a Mockiwi falls underwater, it will quickly lose all its health and drown. Young Yellow Wollywogs hop around on land, but swim when in water. Large Splurchins can slowly move underwater, but can't move at all when they're on land. The water in Pikmin has a faint reflection of the walls and leaves on the trees. This effect is actually obtained by having the walls duplicated and inverted under the ground, as well as having a white "bowl" with the shadows of the leaves. The ground texture underwater is then made see-through. Effectively, when looking at the water, the player is not seeing the reflection of objects high above, they're actually seeing through the ground, into a textured surface. The reflection "bowl" underground at The Forest of Hope. This image shows how the effect works, by showing how the ground is see-through. Drowning Pikmin that are called to Captain Olimar can go through gates as if they didn't exist. This can be seen on the gate that bars access to the Armored Cannon Beetle. This has been fixed in New Play Control! Pikmin. This article or section is a short summary on water attacks. A few attacks in the Super Smash Bros. series are considered "water" attacks, and carry some special properties. Blue Pikmin are completely immune to water attacks, and will not suffer damage nor will they flinch, if hit by one. Unlike other Pikmin types, when Blue Pikmin attack enemies, their attacks do not have their element's properties, meaning that Blue Pikmin attacks are not considered water-based. This article was a featured article from October 1st, 2016 to December 1st, 2016. This page was last edited on February 3, 2019, at 11:18.